Where and How is it failing? First determine exactly where and how the robot is failing to pick. To do this, operate the unit with the cover open. You will need to trick the lid sensor into believing the unit's cover is still closed. Follow this article. Now, run a job as you normally would. Note the location of the failure(s). Also determine if the picker is picking too far to the left or right, or too far forward or backward. It is generally not possible for the arm to pick too far forward or backward at the input or output bin locations. If it is picking too far forward or backward in the drive or printer tray location, there could be a physical problem (See 1 and 2). If the arm is picking too far left or right at any location you can use the calibration utility (3) to fix the problem. Also, the calibration utility can be used to fix pick problems from the drives or printer tray when the picker finger is directly centered in the center hole (4) but just doesn't go down far enough. Finally, you can also use the calibration utility to fix false double pick errors, disc count issues or failures to switch bins in kiosk mode (5). 1. Drive Picking Problems - Front to Back. a. This could indicate a drive tray failure if the problem is intermittent. Try pulling the drive tray out further right before the arm attempts to pick. If you can pull the tray out further, the drive tray is worn or defective. The drive will need to be replaced. Please contact Technical Support for an RMA. b. The entire drive may be moved too far forward or back. For the 4100 series you may use the adjustments screws above or below the drive to move the drive in or out. For all other robots, the cover needs to be removed in order to move the drive housing forward or backward. It is possible that the entire housing may be loose. If that is the case, you may be able to manually push or pull the drive forward or backward to put it in proper position. The screws will need to be tightened for a permanent fix. 2. Printer Tray Picking Problems - Front to Back. a. This could indicate a problem with the printer tray motors or gears. Power off the unit and pull the tray all the way out. Note the position. Compare that position with the position of the tray during a job. It should extend all the way out every time. If it's not, please contact Technical Support for an RMA. b. If the tray is coming out all the way, there may be ink on the tray which is preventing the disc from being auto-centered, which may cause the disc to be out of place for picking purposes. Remove any ink with a cleaning solution. The disc should easily slide on the tray. c. Some trays have slippery tape that helps make the discs slide on the tray. If this tape is missing, damaged or misplaced it may cause the disc to be out of place for picking purposes. Please contact Technical Support for replacements. 3. Any Location Picking Problems - Left to Right. Open the Calibration Utility located within PTPublisher. Go to the Tools Menu - Calibrate the Disc Publisher. (On a Mac, go to the PTPublisher Menu - Calibrate Robot) Select the location on the left and use the buttons on the TOP HALF of this screen to adjust left to right picking issues. 4. Picking is centered but still fails to pick in drive or printer tray. For the 4100 Series or Xi Series, place one disc in the location where the arm is failing to pick. 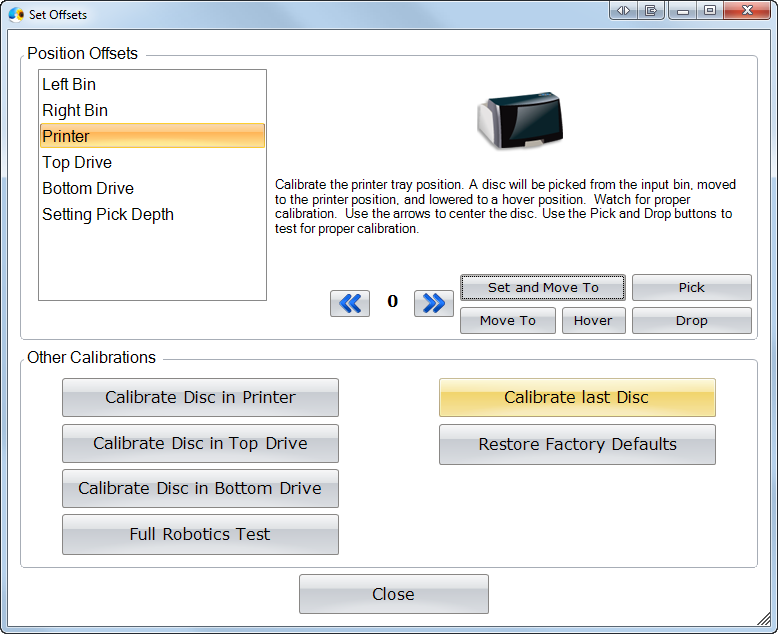 Now click the appropriate button below in the "Other Calibrations" section: Calibrate Disc in Printer, Calibrate Disc in Top Drive or Calibrate Disc in Bottom Drive. The arm will move over the disc, the finger will move down and touch the disc. It has now been calibrated to remember the pick depth for one disc in that location. For other robots select "Setting Pick Depth" from the list on the left. Increase the pick depth by 10. If the issue still persists, the unit will likely need to be repaired. Contact Technical Support for an RMA. 6. Warped Bins/disc trays. Check to make sure the bins are straight. Occasionally, due to improper packaging or age, the sidewall of the bin can warp causing it to interfere with the picking of the disc. The best way to test for this problem is to switch the right and left bins. If the picking problems follow the bin, the bin is the problem. 8. Screen Savers. Make sure that you have turned off all screen savers. Many screen savers turn on if there is no keyboard or mouse use after a certain amount of time. This happens even if the Bravo is still running. Some screen savers use a lot of resources. This can cause the Bravo to mis-pick in the middle of a job. Clean the encoder belt with a paper towel and rubbing alcohol. Pinch the belt and the rubbing alcohol dampened paper towel between your fingers to clean the belt. Be careful not to unseat the belt from the metal posts on either side of the printer. You may have to gently move the carriage out of the way to clean the entire length. If it is dirty with ink splatters or dust, the ink carriage can loose track of its position. Therefore, it can start a print in the wrong position. However, it may not always start a print in the wrong position. The next print might be fine because that time it found the right position on the encoder belt. 10. Power Supply. Make sure you are using the correct power supply for your product. Under-powered power supplies may allow the unit to function normally until it attempts to pick or drop a disc. Click here to find out which power supply to use with your unit. 11. Clear Discs. Remove any clear protective discs from the bin. These are typically found on the top and/or bottom of media spindles. They are used for protection purposes only. They should not be loaded with the regular media. The robot may fail to pick any discs if the first disc is a clear disc.